Kon Tum mountain town in an autumn afternoon, between the cold se se, soy bread soup bowl collapse inside a hot, relish, sweet taste of broth, soft taste of the powder blend into the bar make a sweet sound for bread soup bowl – unique culinary mountain town. And if you have the opportunity to visit the land of this beautiful mountain town, do not forget to visit the shop bread soup later. Small soup small bakery, adjacent curb, at the intersection between road and Phan Chu Trinh Phan Dinh Phung. Shop open quite early, around 3pm but nuop nuop east of passengers, almost rarely empty tables, so to 5.6 pm were sold out. Although the restaurant is always busy but the hostess always hands with feet, diners rarely have to wait long, open a bread soup bowl tail was placed right in front, looked very attractive: clear broth, sweet , emerged plump pig tail chunks, slices of pork bologna, bread soup pale stalks, looming a few strands of green onions … all create a harmonious whole. Taste a piece to piece back Monday, Tuesday, … until the bread soup bowl without noticing. Enlist a rare start, while the hostess a break, I asked what the secret to creating more distinctive taste, sweet cool, not greasy, just a few hours little can “disperse” hundreds bread soup bowl, gently clean the holiday shop. She honestly said that the most important is the pot soups (broth), made from pure tibia. Bones put in boiling, blanching water poured off, rinse thoroughly, this step makes clear broth, beautifully. Next pour cold water flooded the bone, cover tightly and simmer region until the meat is tender, sweet, bold new full tasting spices. Next is prepared pig tail, pig tails do not choose to, bones, meat chewy, tasty bread soup will lose, kind pig tails just right, tender. Ingredients such as pork bologna, bread flour must be fresh, and new arrangements have been carefully the tail soup bowl cake delicious, attractive. Located in the small alleys of Tran Hung Dao Street, right near Central Market, sticky rice cake soup night become familiar address for people. Many generations of students Kon Tum mountain town grew up, in the memories are still raw integrity bread bowl picture soup night Xôi small, charming, warm belly of the night go to learn more about later. From night-flung name has also unveiled a characteristic part of this dish: both had sticky rice cake soup and sell only from dusk until midnight. Unlike other bakery soup, broth, flour cakes, crab, bone, … to separate, only when guests call it beginner hostess egg dough and ingredients reducers. 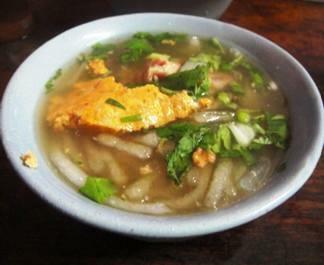 At night Xôi bread soup, all the ingredients are so common in a very large pot, beneath the burning hot stove. You only need to call one hour, hostess was quick to draw a full bowl of rice cake soup ingredients, add a little onion reducers, 5 seconds later, a bread soup hot, steaming, soft taste sweet enough bone tunnel as, for the crab fat, juicy fried slices, add pepper to sniffing. Sticky rice cake soup shop there for a long night, I remember when it cost only 1,500 VND / bowl of noodles, rising prices, the price of bread soup also “pull ladder to climb,” copper rose 5,000, and 8,000 copper and is 10,000 hours, but there was a lot of late-night food street people prefer mountain. Shop also dish distant green beans, black beans sticky, sticky corn, you can individually sort away or share a dish called 3 kind hostess still willing pm guests. Aromatic beans flung plastics, food and grated coconut, add a little sugar white sand, some crushed roasted peanuts also quite interesting, VND10,000 / plate. Snakehead fish cake soup, which comes from Hue dreamy, and long-standing reputation everywhere. Up to the mountain town of Kon Tum, snakehead fish cake soup was modified slightly but still not lost its characteristic taste fragrant, sweet. First time you invite to eat, I was refused because the prejudice test: River fish cake soup cook them up again, tasted like how love is. But before your enthusiasm with promises: “Do not want a ticket, then what good are also” And so I lost so … Cakes snakehead fish soup ingredients though fairly simple, just include fiber made from bread soup snakehead fish rice flour and copper but the processing requires a lot of careful and meticulous. First is security Duct bone broth will be naturally sweet, charming. Processors must select snakehead fish flesh toned river, sweet chewy and not much snakehead fish alimentation bran, to beef, the pale. Fish cleaning to whole steamed to bring in pulses, not to fire too long, the fish will lose natural sweetness. Remove them, separate boneless, fish intestines to separate raw meats segment fully seasoned. Then bring sauteed with garlic, cashews add a little yellow fish beautifully dark. Remaining fish bones and head smashed away leach into the broth pot, which makes the pot of water becomes sweeter sound. 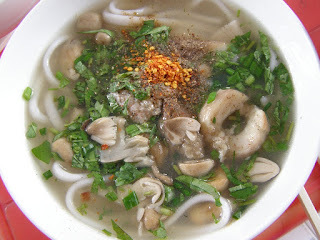 Flour bread soup at Kon Tum snakehead other Hue pie dough slightly. Hue, people used flour noodles are made from pure rice. Finely milled for flour flocculate very flexible. When guests enter, new sellers really sharp knife, cut into thin pieces, long drop right into the pot of boiling water. Eggs boiling water for about 1 minute for the next nine powder, immediately take out the bowl, put catfish, onion pepper, chili on top and add fish and water processing stops at. On the table was always at nem chua little more, eat pork bologna Hue attached. But Kon Tum snakehead fish cake soup, the meal is ready, is the rice flour or wheat stalks, small as a chopstick. When eating only the bread dough into a bowl ratings not need boiling water or eggs, thinly sliced, and served with pepper quẩy or cake. 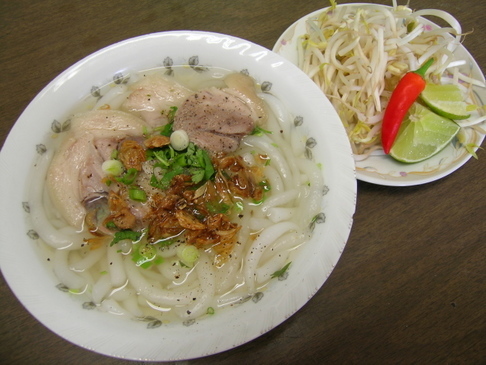 The variations of Kon Tum snakehead fish cake soup also make strange taste, brings songs and unique twist to land Citadel bread soup bowl. As you have seen, the material can differ slightly but still have to ensure sound sweetness, taste delicious hot bowl of noodles Kon Tum. Though only a popular snack but bread soup made unique culinary flavors, pleasing tourists when mountain town Kon Tum up.